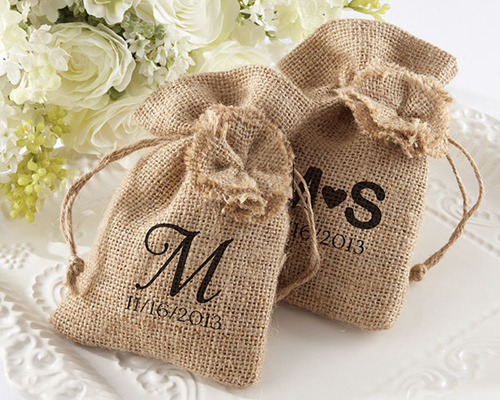 These beautiful vintage burlap / hessian bags are perfect for your wedding bomboniere. The familiar feel of burlap comes back again and again as a reminder of life's true simplicity--the perfect accent for a wine tasting, a forest or mountain wedding, a backyard baby shower. There's a fun, burlap flower near the drawstring, and you can personalize the bag! Sold in a set of 12 for $30. That just $2.50 each!